Abstract: This study uses corpus-linguistic methods to examine the relation- ship between language usage patterns and divergence in text interpretation. Our target of analysis is a set of texts (Czechoslovak presidential New Year’s addresses from 1975 to 1989), which contemporary readers consider repeti- tious and devoid of content. These texts were statistically contrasted with corpora from two different periods: one from the totalitarian period and the other from the contemporary (post-totalitarian) period. The comparison was based on the Difference Index, the most recent effect-size estimator, which was used to enhance the interpretation of keyword analysis outcomes. The two analyses yield significantly different results: the data from the analy- sis using the contemporary corpus were commensurate with contemporary readers’ impressions; those from the analysis using the totalitarian corpus fluctuated in tandem with (and sometimes in anticipation of) political and social changes during the 15-year period and suggested an interpretation of the texts by a reader more familiar with totalitarian texts. Abstract: Some deverbal nouns and adjectives govern their complements as nouns and adjectives. In vladelec jazykov ‘polyglot’ genitive case is assigned by the Adnominal Genitive Rule, and in zabyvčiva na imena ‘forgetful of names’ na is required similarly as in the gloss. With other deverbal nouns and adjec- tives, e.g., vladenie jazykami ‘a command of languages’ and zabyvajuščaja imena ‘who forgets names’, the form of the complement is governed by the embed- ded verb; compare vladeet jazykami and zabyvaet imena. To capture this affinity, the noun phrase is represented as a noun headed by the noun suffix /-ij/ and containing a verb phrase corresponding to vladeet jazykami, and the adjective phrase is represented as an adjective headed by the adjective suffix /-ušč/ and containing a verb phrase corresponding to zabyvaet imena. These underlying representations give syntax the task of uniting /vlad/ with /-ij/ and /zaby/ with /-ušč/, matters traditionally relegated to a morphology component of the grammar. To relegate them to syntax is to enter uncharted territory. Abstract: The present article investigates case usage with the verb bojat’sja ‘be scared’ in Russian. Many verbs with -sja never combine with objects in the accusative case. The verb bojat’sja historically was among them, but this verb is undergoing a shift and is currently used with both genitive and accusative objects. This study examines the parameters that motivate this change. Using data from the Russian National Corpus and an experimental study, this arti- cle shows that the accusative case is more likely to appear when the object is individuated. It is furthermore demonstrated that the use of accusative objects depends on register: Less restricted registers, such as newspaper texts and answers in the experiment, show higher use of accusative objects. Abstract: The purpose of this study was to investigate the “cognate boost” in Russian. 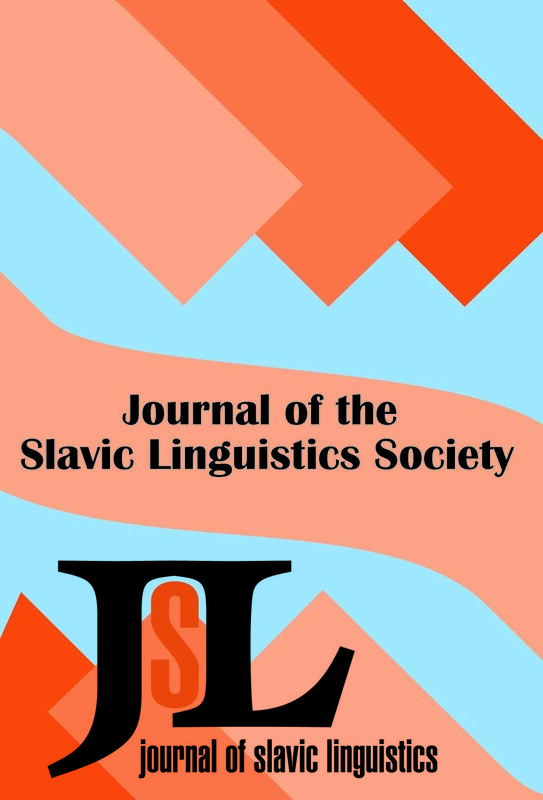 Based on the Revised Hierarchical Model of bilingual memory and the theory of nonselective language storage in bilinguals, it was assumed that cognates would facilitate the performance of L1 English learners of L2 Russian in a picture-naming task, though this effect would be modulated by proficiency level. Twenty-two college-level learners of Russian from two pro- ficiency levels were asked to complete a picture-naming task in Russian. Half performed a task with cognates present and half without. An analysis of re- sponse time and accuracy showed that cognates facilitate the performance of lower proficiency speakers, while higher proficiency speakers are not affected. These results support the theories mentioned previously and show a cognate effect despite the differing orthographies of English and Russian. This paper presents the results of the quantitative and qualitative analyses and their im- plications for theories of language acquisition and storage.